Heavy Tweeting and Twitter’s Mute: How Much is Too Much? Since the introduction of Twitter’s Mute function, there’s never been a worse time to get on your followers’ nerves. Mute is the ultimate silent weapon against heavy tweeters, and despite the hidden dangers of deploying it, the ‘button’ has already become a go-to solution for large numbers of Twitter users. If it wasn’t for the fact that Mute doesn’t stop Direct Messages, the function would be just the same as unfollowing, except of course that the poor, muted wretch doesn’t realise that he, she or it has been unfollowed. The muted account merrily tweets away, blissfully unaware that, say, three quarters of its ‘followers’ are essentially saying: “Talk to the hand”. Automated accounts are highly prone to getting muted – especially those that tweet/retweet intensively and indiscriminately based on keywords. Administrators of websites or blogs, who can measure uptake on the links they tweet, will already be seeing evidence of this when their links are retweeted. It used to be that you could, by and large, roughly anticipate how many hits your site(s) would get based on the number of people following the account retweeting your link, and the retweeter’s general level of influence. But since the Mute function went live, there’s increasingly been a predictable new dimension. Accounts that tweet far too much are rapidly losing their followers without showing it, and it’s obvious from the lack of click-throughs on retweeted links that some high follower counts are totally meaningless. If your link is retweeted by an account with 40,000 to 50,000 followers and no one clicks through at all, whilst the same link retweeted by another account with a few hundred followers brings ten click-throughs, then something is wrong with the ‘big’ account. It’s not really a big account. 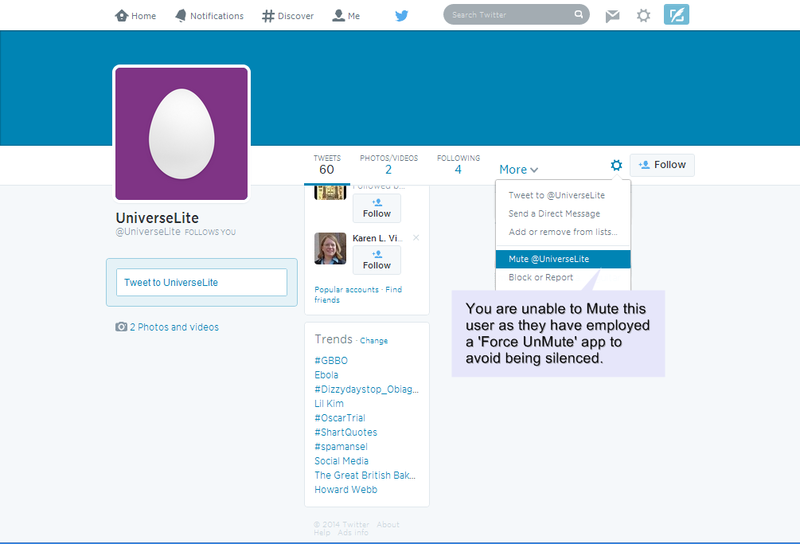 Either the followers are fake (probably bought), or the account has annoyed its real followers into hitting Mute. Yes, of course there are accounts with large numbers of fake followers, but be under no illusions – widespread muting is now a thing, and it’ll inevitably increase as more and more Twitter users discover it and see it as a stealthy solution to unwanted crap. So how much is too much? How many tweets do you have to tweet before your followers get fed up and start muting you? Well, it’s not purely a numbers game. The value of your tweets is also a factor. But in general, if you don’t tweet too often, even fairly useless and valueless messages will be tolerated. It’s when you’re constantly repeating those useless messages, or using automation to intensively scrape or RT quotes, old news, and other stuff everyone’s already seen once too often, that you have a problem. The less value your tweets have, the lower your followers’ tolerance to them will be, and the lower the threshold you’ll be faced with as regards volume. Your followers all have a ‘snap point’ at which they think: “This is too much. I can’t tolerate this. I need to do something about it”. If they know about the Mute function when they experience that ‘snap’, it’s probably going to be their first resort. They don’t want to upset you or lose a reciprocal follower. They just want you, bluntly, to shut your face for more than five minutes at a time, and the Mute button achieves that for them. Another big consideration is the number of accounts your followers are following, and how busy their timelines are. This makes the question of “How much is too much?” a lot more difficult, because those who are only following a small number of accounts and have very quiet timelines can quickly be overwhelmed. Conversely, those who are following tens of thousands of accounts won’t even be in with a chance of noticing you unless you’re tweeting very heavily. The first thing to do is to look at the quality of your tweets. Do you even know what the quality of your tweets is? If you’re scraping or RTing them with an auto routine then the answer is probably no, so bin your auto routine immediately, and start writing your own tweets. Early evidence suggests that auto accounts are among the biggest sufferers from the ‘Mute Effect’, which is probably what Twitter was intending when they implemented the function. Next, stop tweeting for the sake of being noticed and ask yourself if, as one of your own followers, you’d want to see “Going to the shops”, “I want a Porsche” or “Writing a new marketing plan” hogging your timeline every few minutes? Other people feel exactly the same about reading as you do. They don’t want to sit there looking at stuff that doesn’t mean anything to them – especially when it’s getting in the way of what they DO want to read. If YOU wouldn’t be interested in hearing it from some random person you don’t know, don’t expect other people to be interested in hearing it from you. Don’t get trapped by the notion that you have to tweet very heavily because accounts following large numbers of people won’t otherwise notice you. If someone’s following many thousands of accounts they won’t be paying any attention to their timeline anyway because it’ll just be noise. Regardless of how much you tweet, those followers won’t read any of it. So focus on those who are following much smaller numbers, because you can bet they will be reading their timelines. Regulate your tweet volume according to those who are following between 50 and a few hundred accounts, because that’s where the most attention will be. One tweet per hour is about the upper limit – and that’s if your tweets have value. Tweeting every few minutes will get you muted, regardless of what you’re saying. It’s just too much. It’s in pest territory. It’s spam. It’s annoying. Ultimately, the notion that you can somehow win on Twitter by yelling to the point where you block out all else is a fallacy. If you were trying to watch a football game and some random clown kept running in front of you shouting: “Look at me! Look at me!”, you wouldn’t forget the game and watch the clown, would you? You’d get rid of the clown, and watch the game, and that’s exactly what happens in the virtual world. So the key is not to try and compete against the game, but to BECOME the game. To become the thing people care about and WANT to look at. The best practice is therefore to forget about tweet volume altogether and look at reaching more people through relevance and quality. If you never get retweeted, don’t even consider increasing your volume. Work out how you can make your tweets retweetable. Then make sure you’re hashtagging and keywording your tweets effectively to reach the right people in search. If you’re good at this, many of your retweets will come from non-followers. And if any of those retweets go viral, you’re connecting with a very large number of users in a meaningful way. That’s infinitely better than spamming as a policy, and with good tagging and keywording, you don’t necessarily even need the attention of your own followers to get started. PEOPLE WHO’VE MUTED ME STILL GET MY DMs: SHOULD I DM MORE? NO!!!! The DM function is there for when a matter between friends or colleagues is too private for general public view. It’s not, despite what half of Twitter seems to think, a battering ram for use in situations where your ‘marketing’ is hitting a brick wall. Two things can happen if you start DMing people stuff you already know they don’t want. They won’t be paying any attention to their DM inbox and so won’t actually read what you send them. Either way, it’s not going to get you anywhere, so don’t do it. There’s always going to be that threshold beyond which your followers can stand no more. Even if your tweets in themselves are easily tolerable, if you’re perpetually on people’s timelines to the point where they can barely see anything else, you’re bound to get muted by a considerable proportion of your followers. And because you can’t see this happening you don’t experience the same wake-up call you’d get if you left your auto-tweet bot running for a month and then suddenly logged in to find that your follower count had dropped by about 5,000. The answer to the question “How much is too much?”, is that too much is too much. It’s more than any given follower can stand. And if you even wonder whether significant numbers of followers might be putting you on mute, you need to stop and rethink your behaviour because you know deep down that there’s a problem. For a more specific look at individual errors which lead to muting, try 11 Mistakes That Will Immediately Get You Muted on Twitter.